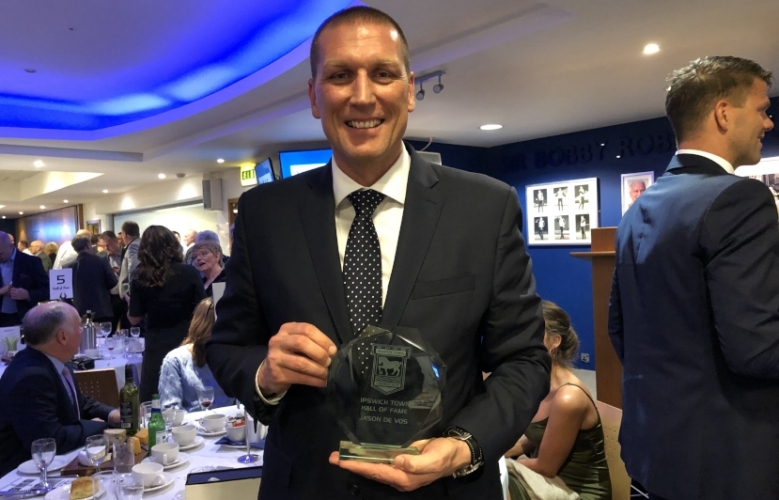 Hermann Hreidarsson and Jason de Vos were inducted into the Town Hall of Fame at Friday night’s 40th annual Reunion Dinner in the Sir Bobby Robson Suite at Portman Road. Iceland international Hreidarsson, 44, was with the Blues between 2000 and 2003 and was a key man in George Burley’s side which finished fifth in the Premier League in 2000/01 and played in the UEFA Cup the following season. De Vos, 45, joined the Blues under Joe Royle’s management and was at Town between 2004 and 2008, by which time Jim Magilton had taken over as boss, wearing the skipper’s armband for much of that time. Hreidarsson was handed his award by his former manager Burley, while current boss Paul Lambert, who attended the dinner along with his backroom staff, presented Canadian international De Vos with his. Lambert also spoke at the event, which was hosted by Terry Butcher and Matt Holland for the Ex-Players’ Association and was attended by former Blues from across the decades and their guests totalling more than 200. Hreidarsson and De Vos will both be on tomorrow lunchtime’s Life’s a Pitch, along with a number of other Blues stars of the past, which is on BBC Radio Suffolk (midday to 2pm). Musical chairs in Luxembourg town square. Rightly recognising their solid contributions at very different times in the club’s history. Well deserved in my opinion.